Steinigke Showtechnic has completely relaunched its online shop. 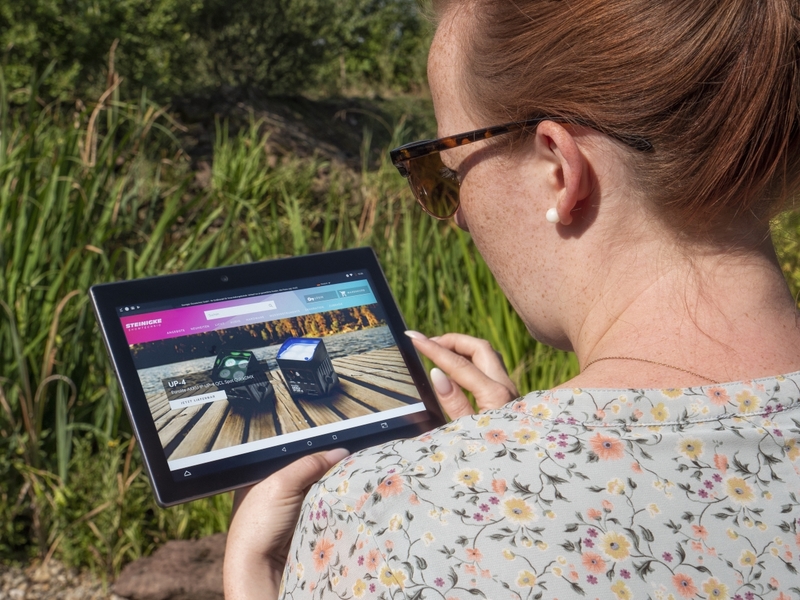 The new website not only scores with a fresh design in company colors; it is optimized for the use with mobile devices, offers the user numerous new filter functions and runs significantly faster than its predecessor. “After intensive work, we can now present our customers the new shop, which we have put our heart and soul into,” says Matthias Schwab, Managing Director of Steinigke Showtechnic. “We are proud to have managed this relaunch completely on our own – with our own people. Our customers now benefit from a completely new shopping experience, better filtering, more convenient operation and more functions in the dealer area”. The wholesaler’s customers had a decisive say in the redesign of its online presence: a large-scale survey formed the basis for all subsequent work. A moving head with a powerful LED, first class equipment and wide zoom: Futurelight presents this with its new DMH-200, which shows off its strengths especially when it comes to projections. The beam angle can be widened from 7.5° to 40°. Whether on a rock stage or in a theater, this spot feels comfortable on many terrains. The new moving head of the long-established company offers particularly sharp projections, even on short distances. The projections are very bright and – if needed – also really big. Narrow beams on a show stage or wide projections in a theater – the Futurelight DMH-200 masters these tasks brilliantly; not only due to the zoom, but also thanks to the motorized focus, its steplessly dimmable COB LED and the stepless frost filter. The 200 W strong, white COB LED of the DMH-200 produces an enormous light output, so the spot is very assertive even on big stages. The color wheel offers 8 dichroitic colors. A rotating 3-facet prism and two gobo wheels provide for variety; one is equipped with 7 rotating, indexable and quickly changeable gobos, the other one with 7 static gobos. Both gobo wheels can be used in combination. The DMH-200 has been designed for mid-sized and big stages. It is perfectly suited for festivals and rock shows. Thanks to its unobtrusive, flicker free operation, the moving head can also be used in quiet surroundings like theaters and TV studios. Program a light show and control it with your feet later – that’s possible now with the foot controller Bigfoot by Eurolite. 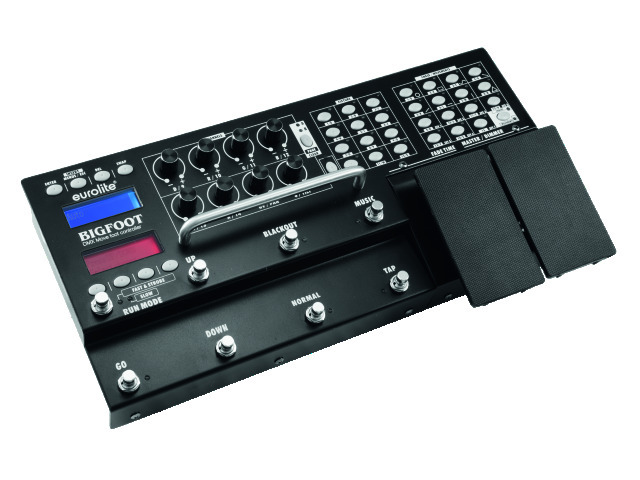 Bigfoot is a full-fledged lighting controller, packed in a foot bar. While most foot controllers are mainly designed for playing pre-installed effects, Bigfoot goes one step further: It enables you to program creative light shows and to control them by feet. Up to 12 devices with 16 DMX channels each can be operated at the same time – from PAR spots to moving heads. Pre-programmed color and movement effects make programming shows easier. Up to 15 chases with several steps can be saved and combined to a show in live operation mode. The Bigfoot is divided into two sections. Above the handle is the programming section with potentiometers and buttons. Below the handle, which also serves as impact protection for the potentiometers, is the live section. It consists of 6 robust foot switches and 2 big pedals. The switches are the same which are used for guitar effects. You control the speed, choose and start a program, use the blackout function or activate the sound control mode with them. The pedals control the fading time of the scenes as well as the master dimmer function for the brightness. If desired, the latter can also be used for controlling other functions or devices like a fog machine. The two displays guide through the programming and make use easier by presenting the names of your shows, their speed etc. in live operation mode. Made of stable metal, Bigfoot withstands knocks and kicks. Thanks to the big handle, it can also be carried very easily. An optional case protects the controller during transport and provides for a secure position during operation. Find more information about the versatile foot controller at http://www.steinigke.de/en/Eurolite-Bigfoot/. In the run-up to Prolight&Sound 2017, the brand Eurolite brings new LED moving heads with compact dimensions and amazing effects to the market: The devices with the melodious name “Hypno” captivate viewers with luminous rings. 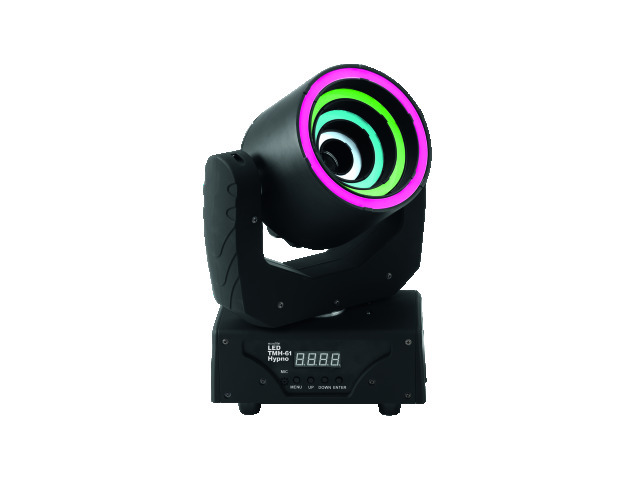 The name predicts the characteristics of these moving heads: LED rings, which are arranged around the lense, create hypnotizing effects in bright colors, while a light beam comes out of their center. At the moment, there are two versions of the Hypno, which, despite their similar looks, differ in their composition: The spot version is equipped with a powerful, white 30 W COB LED; you can modify the projection by using color wheels and gobos. Around the lense, three LED rings with a total of 76 RGB SMD LEDs have been arranged. The second version owns a 60 W COB LED in RGBW colors, which creates a vividly colored beam. Around this, four LED rings with a total of 88 RGB SMD LEDs are at your disposal. You can control the LED rings completely individually on both devices. The moving heads can be controlled via DMX or operated in stand alone mode. Despite their impressive effect and their assertive light power, the dimensions of the Hypnos are manageable: Both versions are only 35 cm high and weigh only 5 kg. This makes them excellent for mobile use; solo entertainers or smaller bands are well equipped with these devices. Even when installed in clubs, the Hypnos perform perfectly. 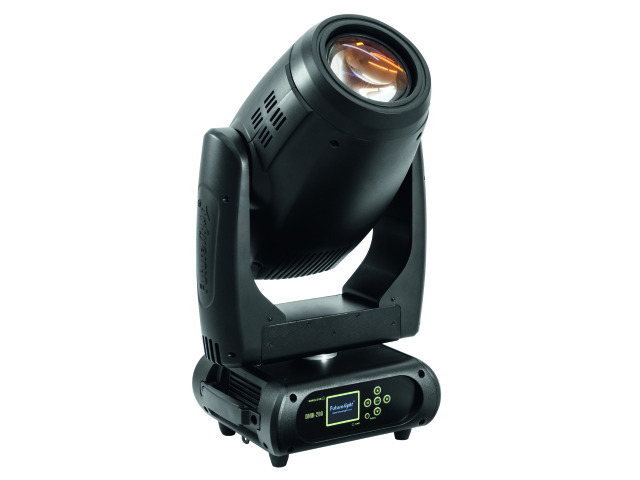 Find more information about these extraordinary moving heads at http://eshop.steinigke.de/eurolite-tmh-hypno/ . 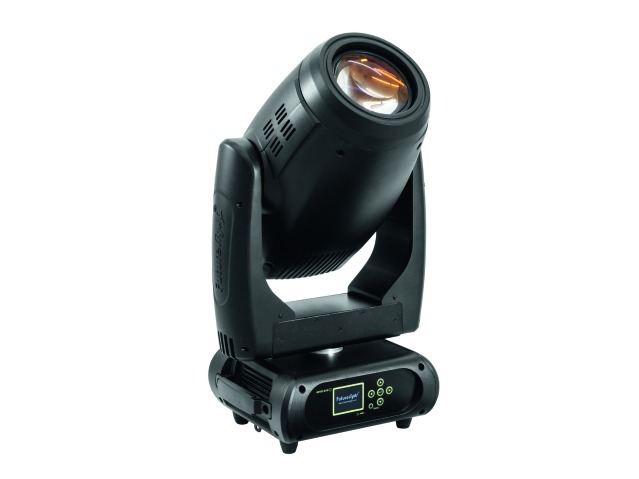 The Futurelight PLB-280 is the fairy godmother among moving heads, as it makes three wishes come true: It’s a spot, beam and washlight at the same time. The moving head is equipped with a 280 W strong Osram Sirius discharge lamp and convinces with its powerful performance and of course with its flexibility. Even the desire for a powerful washlight is completely fulfilled by the PLB-280: Via DMX command, the frost filter is moved in front of the discharge lamp. Noteworthy is the fact, that the filter does not absorb as much light as you’ve seen in other spots. The power of the discharge lamp is large enough to produce a very bright and convincing wash effect. Of course, using the zoom is possible here, too.